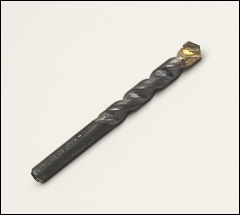 High speed steel bits, masonry drill bits, drills, drill bits, twist drill bits. Please see our complete line of other Cutting, shaping, grinding tools . Cutting diameter and shank diameter are the same size, except the two items noted below with a reduced shank. Disston's Blu-Mol black oxide drill bits. Good performance in soft metal, low alloy steel, wood, and plastic. Black oxide finish provides lubricity and rust protection. 135° split point allows faster aggressive cutting without "walking". Highly polished flutes removes chips fast. Intermediate sizes available. Sold by the pack, 6 or 12 bits/pack. 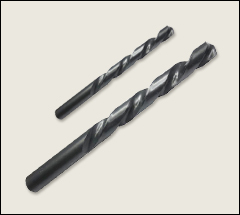 Carbide tipped, deep flute design works in brick, concrete, and sandstone as well as in some abrasive plastics. Intermediate sizes available.